Select a metal roof material for your metal porch roof or home's roof project based on its durability, beauty, and value. A metal porch roof is comparable with an asphalt shingled roof regarding noise levels and is also designed to withstand adverse weather conditions. Better yet, metal roof panels, if installed correctly, can last 50 years or more saving you thousands in replacement costs. There are basically two categories of metal roofing: vertical seam panels and stamped. Vertical panels are popular in a lot of rural and industrial areas. The panels are formed in rows and the vertical seams of the panels extend from the gutter up to the roof edge. 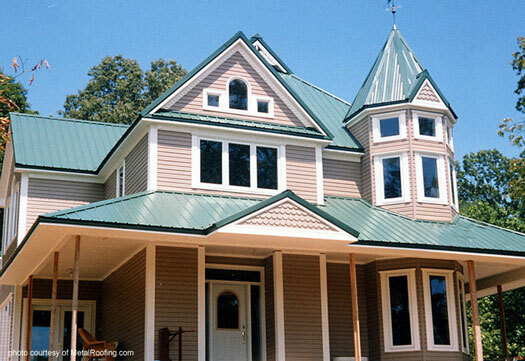 They are currently the most popular type of metal roofing in North America. 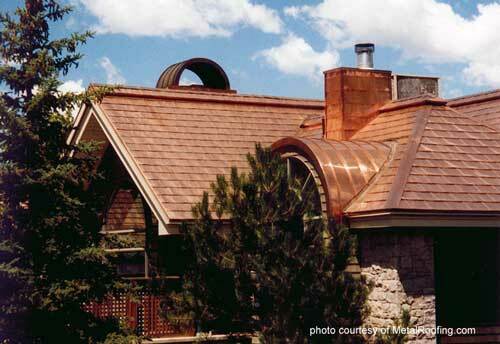 Stamped metal roofing can look like clay tile, cedar shakes, and even slate. It is virtually impossible from your yard to tell whether you have an actual cedar shake roof or a metal roof that looks like cedar shakes. There are hundreds of hundreds of colors available. A lot of people in warmer climates tend install lighter colors because of the heat reflectivity that a metal roof provides. Metal roofs can be painted a true copper color but they can also create a patina look that many people love. There are actually paint systems that they can that can mix green and copper into the paint so that in the morning with the sun at a certain angle your roof will have an all copper appeal but in the afternoon as the sun shifts over the house it will change to a more green patina roof. 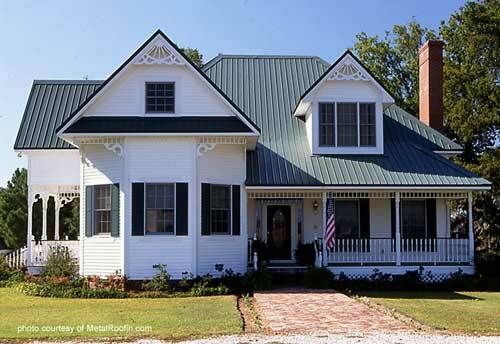 It is amazing what can be done with metal roof paint. Steel, aluminum, and to a lesser extent stainless steel and copper are the most common metal roof materials you'll find for residential homes. However, zinc and even titanium are used for various architectural applications as well. 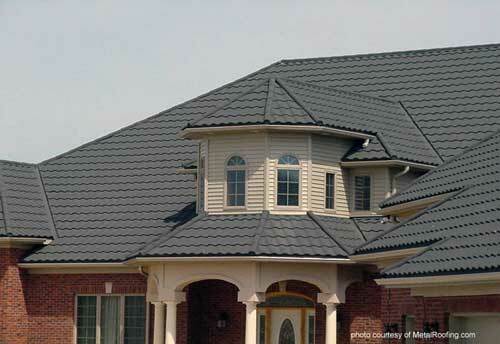 Steel is by far the most popular metal roof material. Although lightweight, it is heavier than other types (about 1 1/2 pounds per square foot) and is more sturdy than aluminum. It resists fires and is a good heat reflector. Safe, steel roofs are strong enough to battle the severe weather conditions such as torrential rains, heavy snows, hail and strong winds. Steel roofing is produced in various thicknesses, routinely 24 to 26 gauge (26 being thinner than 24). Either is satisfactory as they are installed over solid roofing such as plywood or oriented strand board. Steel rusts. To prevent this, steel roof materials are coated with zinc (galvanized) and then sealed. They are typically produced in large rolls at the mill, coated, and then painted. The rolls are then shipped to a manufacturer who then forms the roll of steel into long panels or stamps into shingles. Homeowners are usually concerned most with fading. Painted metal roofs have undergone a very sophisticated paint process resulting in various degrees of paint quality. Some panels will fade more than others over time. The higher-quality painted panels usually cost more but if fading is an issue for you, we recommend you invest in high quality panels. Although much more expensive than steel, stainless steel is the perfect option for both appeal and best of all - it won't rust making it ideal for coastal regions. To reduce sheen, stainless steel panels usually have an alloy coating to give it a more natural look. Stainless steel may be more expensive initially; however, when factoring in installation costs it then becomes quite comparable to other metal roofs. In addition, the life cost can be a lot lower than for steel panels. If you live in fire-prone areas, stainless steel's melting point is 2732 degrees Fahrenheit (1500 degrees cells), much higher than for aluminum or copper. Because it is thinner than other metal materials, stainless steel can be used for flat, pitched, or curved roofs. Note: A common error is installing stainless steel panels with non-stainless steel fasteners. You must use stainless steel fasteners due to galvanic corrosion. Who doesn't notice a copper roof? Its appeal is the aging process whereby over time, copper takes on a patina finish, which to most homeowners is very desirable. Lightweight, it is also ideal for porches and homes in snow country by lessening the overall weight of the roof. It is fire resistant which also makes it perfect for areas prone to fires. As another advantage, it is one of the least corrosive metal options available. Aside from being expensive, copper is a great option and looks beautiful whether it covers your entire roof or just the front porch! Have a complex roof design? Aluminum may be just what you need. Because it is lightweight, it can be formed to cover complex angles making it a popular choice. It is non corrosive making it ideal for coastal areas. Aluminum is also a favorite for hail-prone areas. Lightweight (only 40 pounds per square), you won't need any roof reinforcement nor will it cause sagging. It can also handle winds up to 100 mph. It is normally painted or coated to enhance its overall appeal. Not as popular in the U.S. yet, zinc is a favorite in Europe. I've read where 60 percent or more of residential homes are using zinc roofing with the expectation they will last up to 100 years or longer. Although not a metal roof material, solar is a good option when considering installing metal roof panels. Thin-Film PV Laminate Solar Panels film photovoltaic (PV) laminates replace those old heavy panels, and do not require drilling. It is self adhesive and must be applied to metal making it ideal for front porch roofs. They are embedded with wired cells that catch the solar rays. Insulated panels are another metal roof material and range from 2 inches to 6 inches in thickness and have R-values from 15 to 43. Heavier than typical metal roof panels, insulated panels will possibly require different equipment to load, unload, and install. In addition, installation of the panels requires considerable skill to ensure you get the full benefit of the panel. Durable: Very sturdy, non-combustible, highest fire-retardant rating available and withstands hail, wind and severe storms. Usually comes with a 30 year or more warranty. Installation: Although they cost more than other roof types, they are often installed over existing shingles saving the homeowner some labor costs. 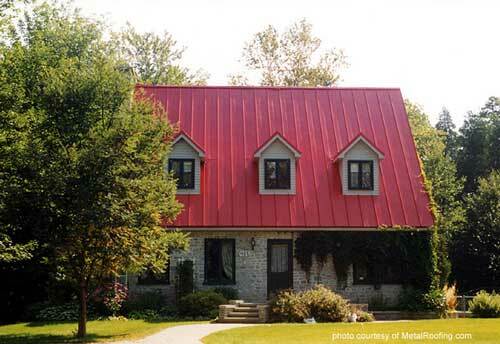 We have some tips for installing a metal roof. Energy Efficient: Metal roofs reflect the sun (up to 70% of the sun's rays) This results in reducing the heat absorbed which keeps your house cooler and reduces cooling bills. In winter, metal roofs tend to keep snow from building on your roof. Overall Costs: Initial costs are higher then traditional roofs; however, overall costs are typically lower. When installed properly, there is little to no maintenance costs, less repairs, and a longer lasting roof. Some states offer tax incentives also. Noise: Many like the sound of rain; however, metal roof materials are thought to be more noisy than asphalt shingles. If installed correctly, contractors can significantly minimize the noise with additional insulation and better sheathing. Modifications: Modifying a metal roof is not as easy as it is on an asphalt one, composite, or even a shake roof. 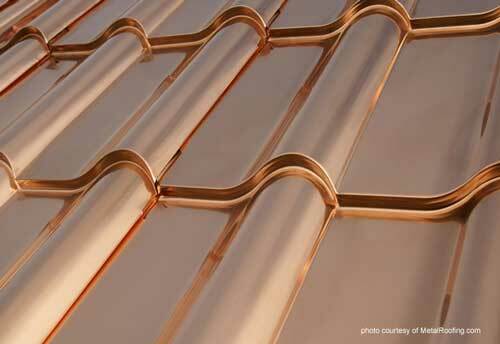 likely find metal roofing trickier to modify than asphalt, composite or shake shingles. If planning to install solar panels, do so during the initial installation. 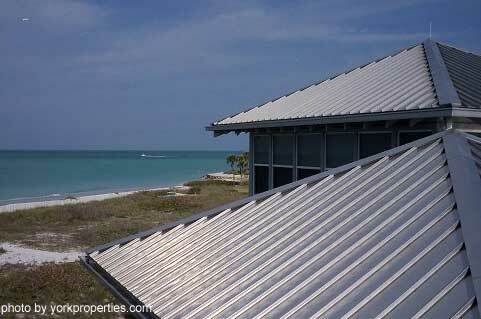 Costs: Metal roofing is more expensive than traditional roofs. This is offset by lifetime overall costs; however, it is recommended that you live in your home for at least 10 years to reap the benefits.